We are Monzu Fresh Pasta, serving Italian and contemporary flavors made from scratch in the heart of San Diego’s East Village. In drawing upon our European heritage and passion for hand-crafted meals, we take pride in transporting you to Italy via our home country’s most beloved staple: fresh pasta. Monzu is a Neapolitan corruption of the French term “monsieur.” Neapolitan and Sicilian Monzu were renowned professional French-trained chefs who worked for aristocracy and members of the Bourbon court in 18th and 19th century Southern Italy. They became especially popular for their ability to mix French cuisine and Southern Italian ingredients. Their secret recipes, among them many different pasta specialties, are today part of the Italian food tradition. At Monzu Fresh Pasta we celebrate these techniques by preparing the best Italian recipes using Italian and Californian products and organic ingredients. 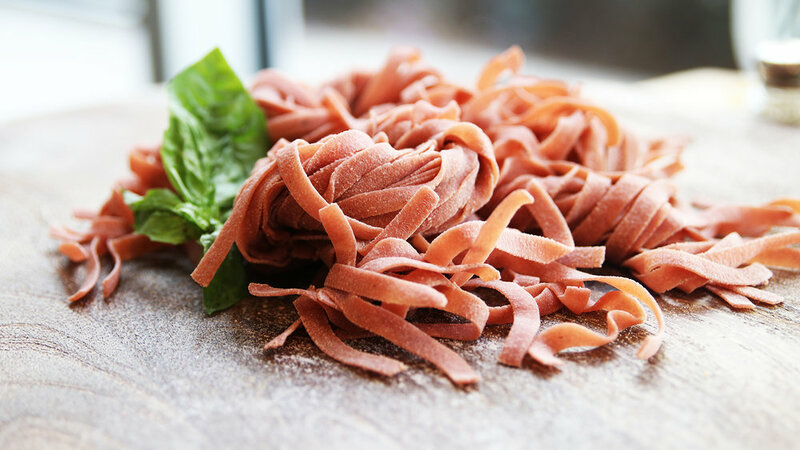 Monzu Fresh Pasta is the family-owned creation of Neapolitan Aldo de Dominicis Rotondi and Serena Romano, a husband-wife team who share a strong belief in the Slow Food movement and quality ingredients. Having trained with Italy's master pasta makers, Aldo and Serena lead the kitchen with centuries-old pasta making techniques and recipes hailing from distinct Italian regions including Sicily, Campania and Puglia. Here you’ll discover authentic fresh pastas and sauces crafted in-house using local, organic and seasonal ingredients as well as pasture-raised eggs. From ravioli and tonnarelli to tagliatelle and lasagna, every pasta is personalized with your choice of sauce, like Bolognese and Ligurian pesto. Plus, enjoy daily and weekly specials and savor the fact that several of our dishes cater to dairy-free, vegetarian and vegan diets. Located steps from Petco Park, the San Diego Convention Center and the San Diego Public Library, Monzu Fresh Pasta welcomes you with a Mediterranean-inspired dining room and sidewalk seating along Tenth Avenue. Order your pasta as a grab-and-go meal, or dine in while sipping Italian wines and local craft beers.